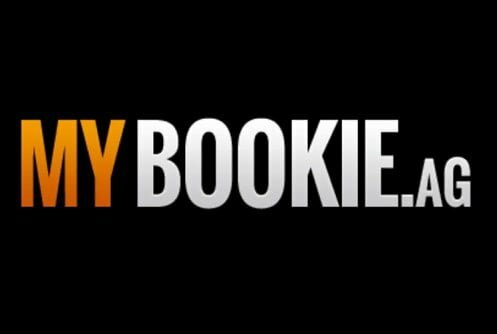 Mybookie is something a little different, If memory serves me correct this is our first casino review that incorporates a sports betting website. You’re most probably wondering why we decided to venture down this route? Reason being it offers holistic game play, in other words here you can play casino games, it incorporates a top-notch Live Casino, mobile gambling and if you’re into sports wagering you can place a couple of bets on your favorite basketball (NBA) or NFL football team. Above all it accepts patrons from the USA and from around the globe. The operator carries a legitimate license from the jurisdiction of Curacao a small island situated in the Caribbean. Now that all the formalities are out the way why does MyBookie Casino deserve your business? As you work your way around the site you’ll see that it offers you the best slot games with high resolution visuals powered by Betsoft and loads of on-going promotions with cash back incentives. The minimum deposit to play at the site is $45, newbies qualify for a sign on bonus of 100% up to $300 (casino), But by using our exclusive promo code bonus you will get double!! 200% Up to $600 on slots and 100% up to $500 for table games. 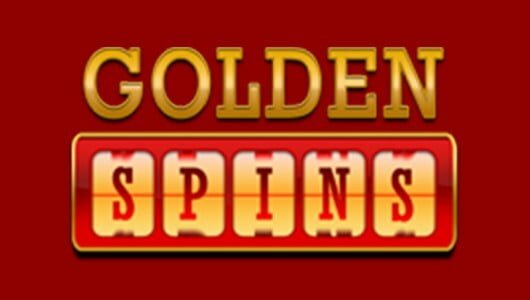 New casino players receive a exclusive slots match bonus of 200% up to $600 <(WHIZZ200) and 100% up to $500 on table games < (WHIZZ100) while regular depositors get reload bonuses of 25% up to $500 and there’s also a refer-a-friend-program of $100. In essence for every buddy you refer you’ll get $100 but they must deposit and play. The good news is that the operator also throws in some extra bonuses to sports book players which entails a match bonus of 50% up to $3,000 and rebate bonuses of 7%. Before you accept a bonus ensure that you understand its terms and conditions. Each bonus has a play-through requirement that must be completed first before a withdrawal is allowed. 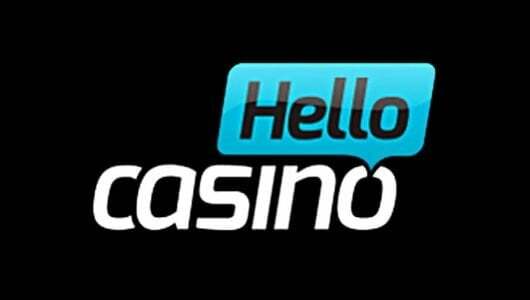 Although the operator is primarily a bookie site it has a lot to offer to casino players. Here you can play the very Betsoft best slots (up to 60), table games and specialty games. The good news is that you can play them right in your browser, no download is necessary! The games can be played for real cash or simply just for fun on desktop or on mobile devices. 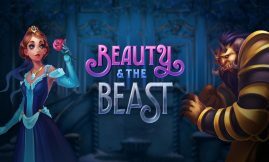 The pick of the Betsoft games are the 3D slots, not only do they have impressive themes but they’re laced with bonus modes that offer you pennies on the dollar. If you’re a low staked player don’t play high variance slots because your bankroll will disappear like a paper in a bonfire. Rather play games that’s in line with your budget. 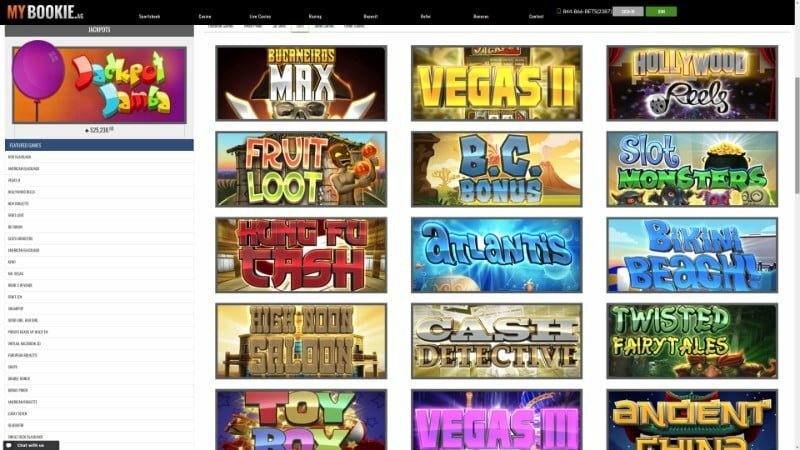 The cream of the Betsoft slots to us are Mr Vegas, Safari Sam, The Glam Life, Greedy Goblins (high variance) and 4 Seasons. Before you play a slots consult its ‘Help Screen’ (Paytable) first; it tells you which symbols offer the biggest payouts and how its bonus games (free spins) are initiated. MyBookie.ag has a nice bouquet of table games that includes blackjack and roulette variants, baccarat, pai gow poker, craps and red dog. Before you play a table game it’s important that you understand its odds, rules and betting strategy. 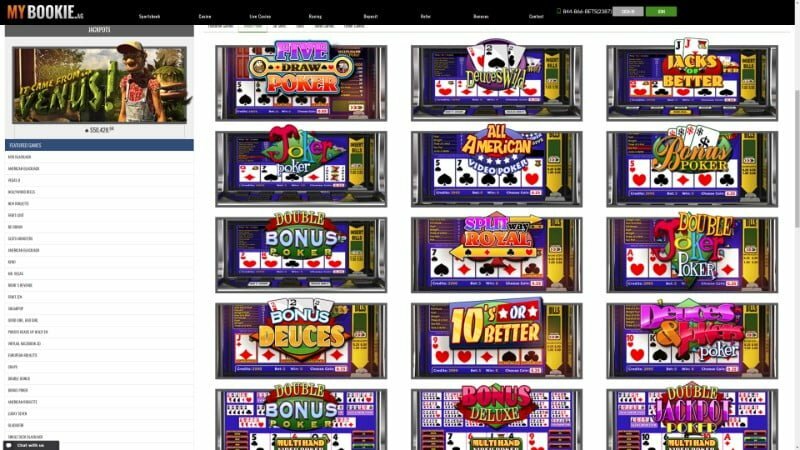 MyBookie Casino is the premier destination for live dealer casino players from the United States and abroad. The live casino has live blackjack, European Roulette, Super 6 and Baccarat. 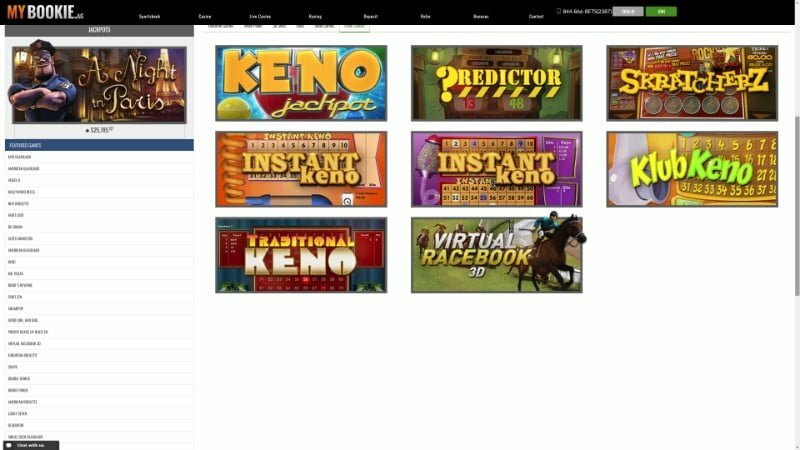 The operator is powered by Betsoft, Nucleus, GameSoft and Visionary iGaming. Beyond its live casino its game library is stocked with an abundance of slot machines, table games varieties (blackjack, roulette, sic bo, baccarat, craps), video poker and specialty games (bingo, keno and scratch cards). The interactive live dealer casino has an array of scrumptious goodies starting with an impressive sign on bonus, great customer support, live HD (High Definition) games that’s streamed 24/7, comps and rebate on losses. Players can deposit and withdraw their wins using credit/debit cards (Visa, MasterCard), ACH, Bitcoin, Person2Person and Phone Transfer. Once the required verification documents have been given withdrawals are handled within 48 to 72 hours, 3 to 5 days for credit cards and up to 14 working days. The operator’s weekly withdrawal limit is $2,000 but VIPs have higher withdrawal limits. Player information is protected by Secure Socket Layer technology, the same encryption software used by financial institutions. Newbies get a welcome bonus of 100% up to $300, to qualify for it you must deposit $25 or more. On a deposit of $100 you’ll receive a bonus of $100, play with $200. Wins can only be withdrawn once the bonus funds have been rolled over 30x the deposit and bonus sum. Once you accepted the bonus the roll over requirement must be completed within 60 days otherwise the bonus expires. Players can claim 8% rebate on their blackjack losses, come to think of it it’s a smart move given that ‘cashback’ can be claimed on the 21st of each month. MYB live dealer casino has a slew of promotions that includes a 100% refer a friend bonus, a 75% monthly reload bonus and a monthly cash back of 7% up to $500 (live casino excluded). The live dealer casino section offers you a choice between live blackjack, Super 6, European Roulette and live baccarat (4 varieties). 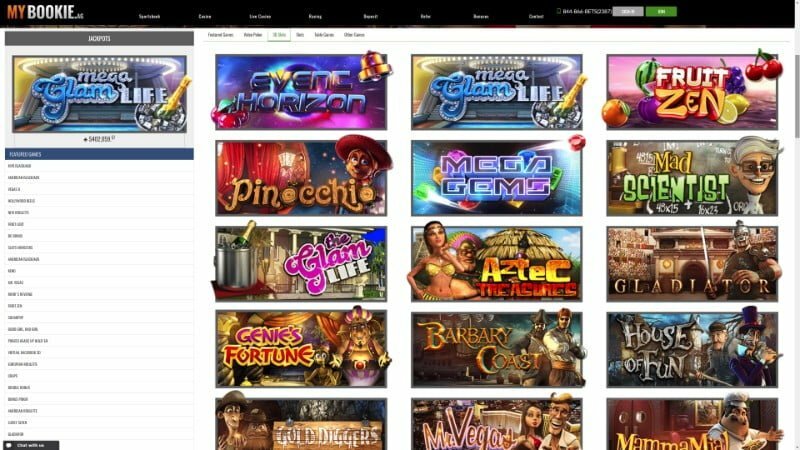 Each live casino game powered by Visionary iGaming is streamed to your computer via a webcam from a live studio based in Costa Rica. The games are interactive; you can chat to the dealer, see the cards being dealt and keep a close eye on the ball as it jumbles around the roulette wheel. The betting limits start with $1 up to $100. The table betting limits for each blackjack game (Super 6) is $1 to $100, to be good at blackjack you must understand the basic strategy, odds and rules. 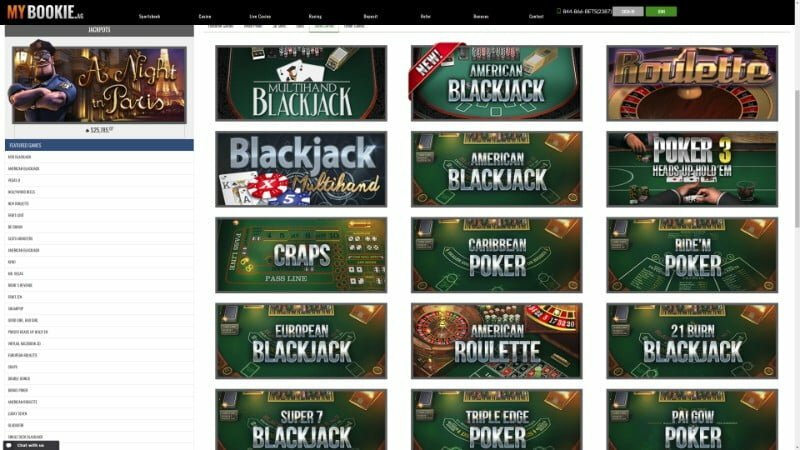 MYBookie casino has two blackjack tables: Gold and Platinum which caters primarily to higher rollers where the maximum betting limit shoots up to $100 per hand. Unlike at the casino which offers both European and American roulette, only the former can be played at the live casino. The betting limits are $1 up to $500 per hand, don’t expect fast game play because the games are played at slow pace. Essentially this gives you more time to play each hand and to formulate a proper betting strategy. An extra feather in MyBookie’sag cap is its impeccable service to its players. I decided to contact the site through live chat and spoke to ‘Lucy’, not only did she explain to me how to claim a deposit bonus but she explained its bonus terms to me too. If Lucy is the yardstick of the site’s support all I can say is that you’re in very good hands. Your private details are protected by SSL encrypted software that garbles all your information making it impossible for any hackers to gain access to. Pertaining to the trustworthiness of the games all I can say is that they are legit and safe. I must also point out that I could not find any company that tested the RNG (Random Number Generator) of the site’s games. I did a random test to see if the games are safe and I’m glad to report that they are. I played Rook’s Revenge with a bankroll of $50 and won $5. For a U.S-facing online casino/bookie MyBookie offers a nice variety of deposit and withdrawal methods. They are Credit/Debit cards. wire transfer, Bitcoin, Person2Person, Phone Transfer, ACH, and MoneyGram. 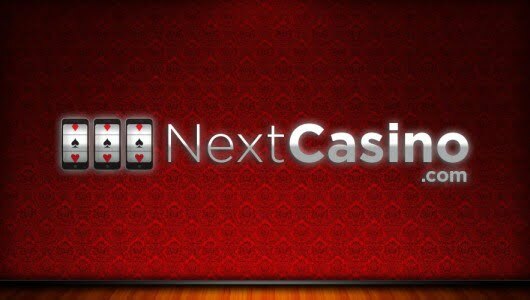 To play at the casino the minimum deposit is $45 and each deposit method has its own deposit cap. For instance the smallest deposit for MasterCard players is $45, for Bitcoin it’s $25, bank wire it’s $2,000, ACH it’s $100 and for MoneyGram it’s $100. Withdrawal fees are charged for each payment method. The minimum withdrawal amount is $50 for Bitcoin and for other cash out methods it’s $100. MoenyGram users can withdraw up to $400 per week, ACH and Bitcoin $1,000 and wire transfer up to $2,000 per week. Cash outs through bank wire is cleared within 5 working days, Bitcoin within 24 hours, MoneyGram and Western Union takes 24 hours. The only caveats I have is that the weekly withdrawal limit of $2,000 might ‘chase’ high rollers and withdrawal fees can be as high as $50. Then VIPs are allowed to withdraw more cash and we found that the casino is quite forthcoming and lenient in terms of its withdrawal policy.